A meditation—a lesson in patience and perseverance, literally a visualization of the stream of consciousness with one thought linking to the next, and the next. 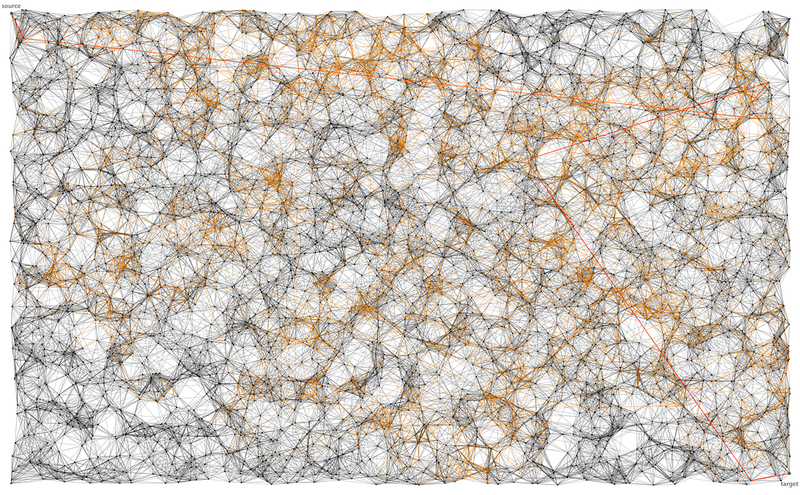 We see this stream traced as a walk (in orange). Ironically there is a simple path from source to target, a creative leap, an aha moment, a short cut. But inside the network it is impossible to see. We are lost in the world without a map. Trying to fulfill a desire, or simply find our way home, we search not quite randomly for a destination, never really knowing how close it always is. This work is computational, exploring and visualizing topographies of networks that model the structure of our brains and the structure of our culture. Parsing a network from source to target, is all about finding our way—from problem to solution, from person to person, from here to home. We find our way through a small world, a network of incestuous links and a little randomness. It's pathfinding through myriad maps. And as behavior follows structure, it's not surprising that the intricacies of our lives mirror the filagreed arbors of our neural forests.